Delicious pastry dough with yogurt, that bakes to perfection and an easy spinach filling. I could not get enough of these yummy parcels of deliciousness when we visited Istanbul a couple of years ago. They are called Pide or Fatayer across the middle eastern countries and are very popular there. The fillings are typically spinach, meat and /or egg. 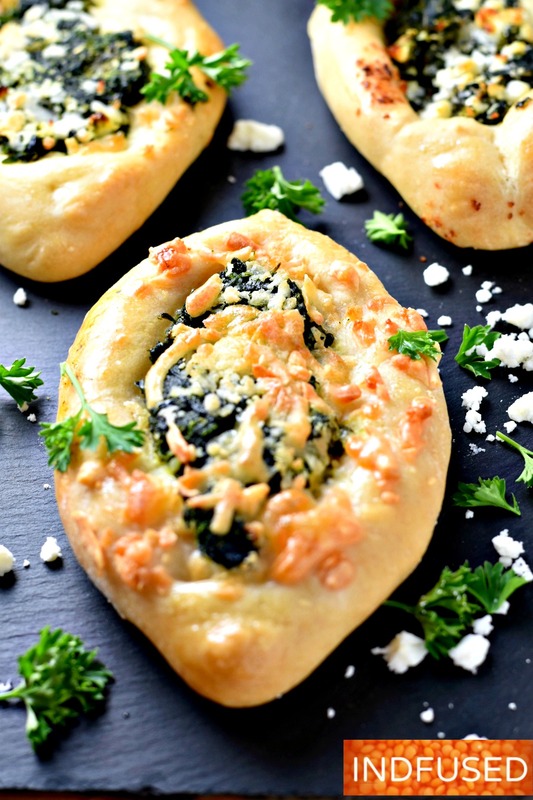 Given my Indian palate, I paired it with a lightly spiced, Indian spinach filling with healthy turmeric, and topped some of the fatayer/ pide with mozzarella cheese and others with feta cheese. Talk about multicultural! My husband, ‘the in house critic’, preferred the feta cheese topping. There are many recipes for the dough but I decided to experiment with a dough made with bread flour and yogurt. Typically, the dough needs to rise only for about an hour or until it doubles in bulk. But our plans changed after I had kneaded the dough. While the dough was rising, I went out to a market where I spotted some mouthwatering fish…. So, the menu for the day got completely altered 🙂 I know you foodies will relate to my story. I stuck the risen dough in the refrigerator overnight.The next day I left it on the kitchen counter until it was at room temperature.The dough was just fabulous! I cannot get over how flavorful it was with the yogurt, so easy to work with and baked perfectly. Like I said, I absolutely loved this dough- the texture and the aroma was amazing! The taste also reminded me of fresh baked naan. Here is a step by step pictorial to show how easy they are to make. Look at that dough in step one! Super easy recipe for Fatayer/ Pide- A multicultural twist! 1 ¼ teaspoon rapid rising yeast. Make the dough. To ¼ cup of the lukewarm water,add the sugar and the yeast. Stir, cover and set aside for about 10 minutes or until the yeast is frothy. Add the salt to the bread flour. Mix in the yogurt. Then add the frothy yeast mixture and the ¼ cup lukewarm water. Knead the dough until a ball is formed. 3 minutes in the Kitchenaid stand mixer. Keep the ball of dough in an oiled bowl and cover the bowl tightly with a lid or saran wrap. Set it aside in a warm place to rise for an hour or until the dough is doubled in size. Meanwhile make the filling- In a saute pan, Heat the oil over medium heat. Add the mustard seeds and when they start sputtering,add the garlic. Saute briefly and add the chili pepper and onion, saute until the onion is golden brown, taking care not to burn the garlic. Add the turmeric powder, saute briefly for 30 seconds or so and add the spinach, salt and sugar and stir it well together.Cook until the spinach is heated through. Take it off the heat and let cool. Pull up the oblong sides of the dough and pinch the edges together. Flatten the Pide with the palm of your hand. Transfer to a baking sheet lined with parchment paper. Repeat with the 7 other dough balls and filling. Bake the fatayer/ Pide in a 375-degree oven for 25 to 30 minutes or until the Fatayer/ Pide are golden brown and baked through. Enjoy the multicultural Fatayer/ Pide! This looks delicious Sandhya, love the little changes you made for an Indian palate. Hope to try this out in my kitchen! Thanks Zeba. Do try them. This first popped out on my feed when I first logged on Sandhya. That first shot is oh so tempting! Even though it’s breakfast time, I know it would be just the ticket for a cold winter morning and it would satisfy till lunch time. The addition of yogurt always makes anything great doesn’t it? I’ve started using yogurt when I make my parathas these days. The ingredients sound so tempting too. Great share, have a wonderful weekend. Thanks Loretta. I do want to make these for breakfast again with eggs in the center. I prefer warm breakfasts in the winter too. Yogurt in this dough gave it a naan like taste but the texture of the bread was very different. I really loved it. I remembered your post about leaving the dough in the refrigerator and although mine had to be refrigerated after rising, the result was very good. Yes I like yogurt in parathas as well. Wonderful recipe! Love the addition of spinach in here. Thanks so much Laura. I want to try a gluten free dough for these. How well they turned out Sandhya!! Fatayer is generally boat shaped but sometimes they are made in other shapes too. I made chicken Fatayer but I have to try this one. Thanks Ana! I want to make the chicken one as well.